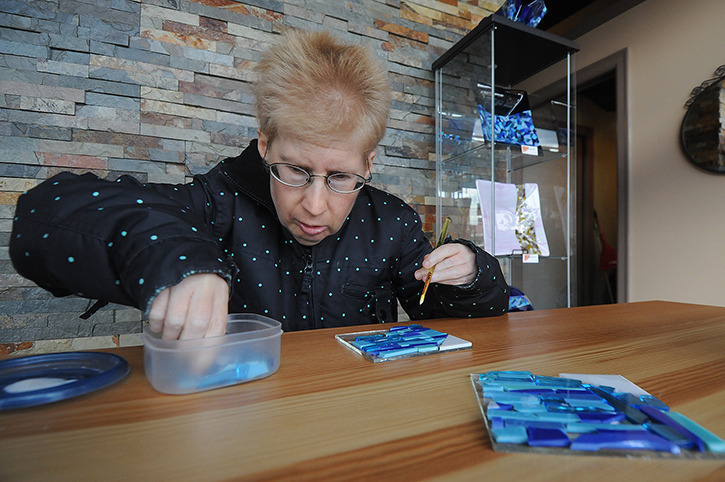 Studio seventy three in Surrey provides new space for artists with developmental disabilities and acquired brain injuries. Oct. 23, 2015 7:00 a.m.
Artists with special needs have a new place to showcase their talents in Surrey. The Community Living Society (CLS) recently opened studio seventy three in Newton, and its artists-in-residence are busy producing fused glass art, soaps and candles. It’s a social enterprise, says coordinator Mike Wesco. He says the studio will soon expand to include pottery. The art and products are sold by the artists to support themselves and the host society. The New Westminster-based CLS is a not-for-profit social benefit organization that has provided individualized, flexible and creative supports to people with developmental disabilities and acquired brain Injuries for more than thirty years.